Radio was huge. The next logical step was to add visual information to the audio via radio waves. Television is really a three-part invention: 1. the TV camera that turns a picture and sound into a signal; 2. the TV transmitter that sends the signal through the air; and 3. the TV receiver (the TV set in your home) that captures the signal and turns it back into picture and sound (1). Microwave relay networks were later established for the additional bandwidth. In the 1930s TVs were being massed produced but with the great depression, were a luxury. Plus radio at this point was more reliable to late breaking news about the war than TV. In the 1950’s TV really caught on. TV ownership soared from 10% in 1950 to 87% in 1960. By 1967 most TV broadcasts were in color (2). A strange as the scene was, the concept write up for SSE by Ray Bradbury was trying to illustrate that people are being bombarded by information. Bradbury, R. (1977). Man and his Spaceship Earth. Theme show for EPCOT Center/Future World. WED Enterprises. Sure, TV had huge impacts but what it impacts is people – this new version of the scene shows the warmth of the family missing from the last scene. 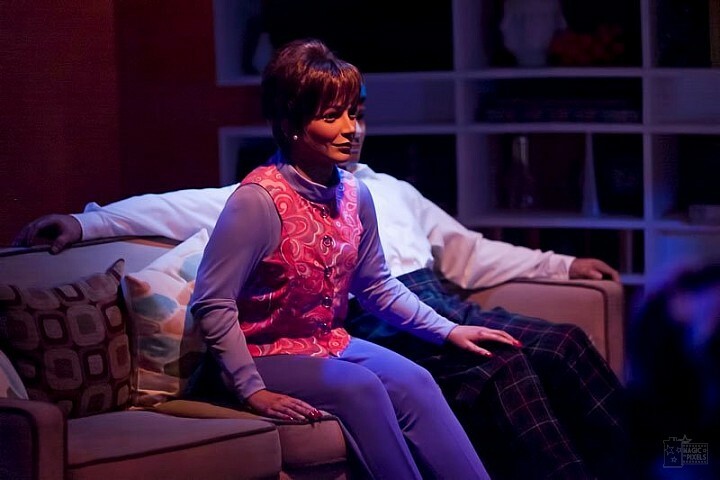 Not only is the family brought together by television, they are brought together in a special room designated and arranged specifically for this purpose (4). And this room now has a back wall! There are many details that make this an awesome mid century modern living room. 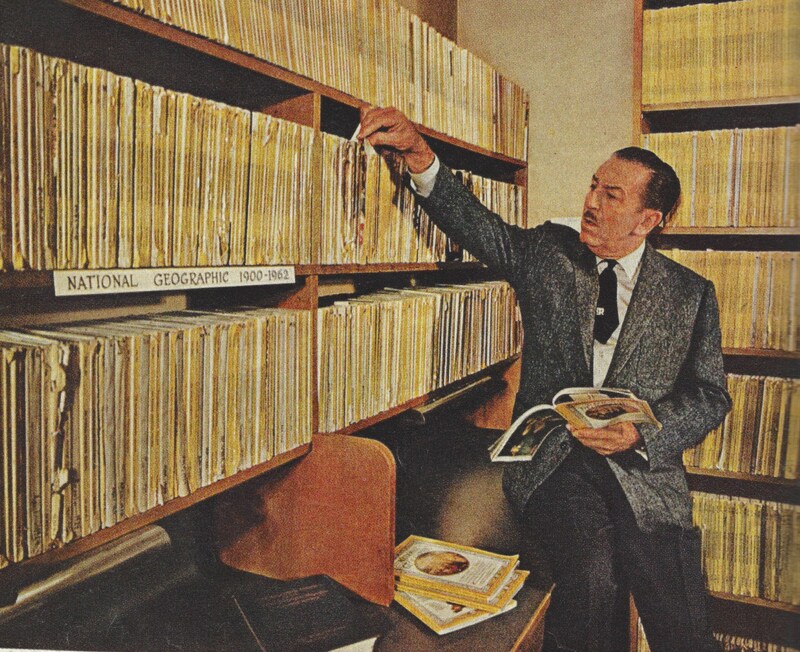 The Chrome Swivel Chair, Tension Pole Lamp, Accent Shelves, Statement Art Wall-piece, Terrarium, Shag Carpeting, and even a collection of National Geographic Magazines – only a bit smaller than Walt would have. Other details show that the room wasn’t just for TV. 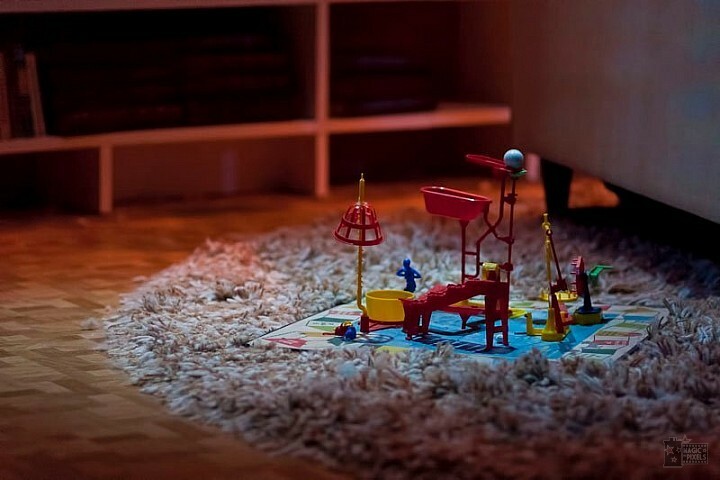 A game of Mouse Trap is set up on the floor. 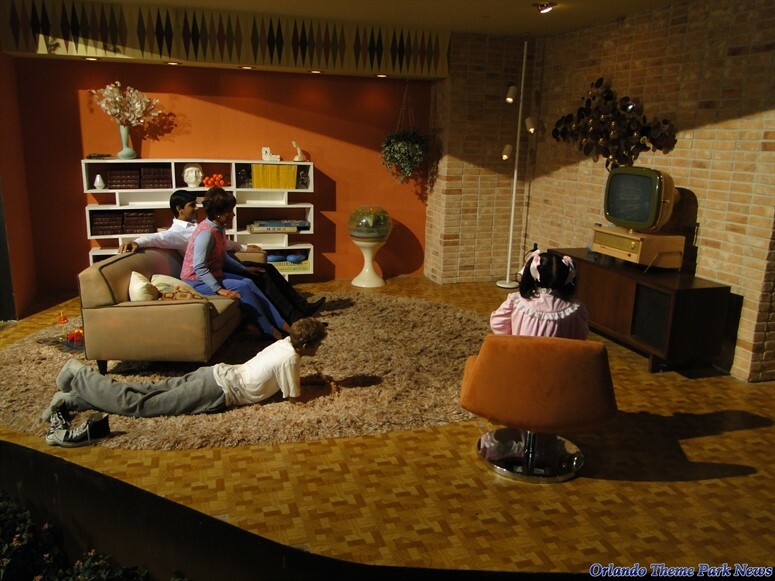 There is also a vinyl record record resting on the floor to the left of the television set. This used to be a Pinocchio LP but has since changed to a Beatles Album. According to one cast member, “The toys, books, and games on the shelf are real, and they’re even from the same year, 1969. The only thing that isn’t from 1969 is the Beatles album, which is from 1982.”. Mom put down the clicker she had from the previous scene and Dad is still chillin. A brother has been added to the scene (another visitor from the future we will meet later). 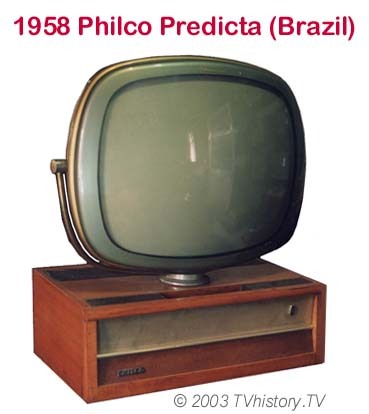 The TV in this living room is a fantastic retro-future 1958 Philco Predicta from Brazil. 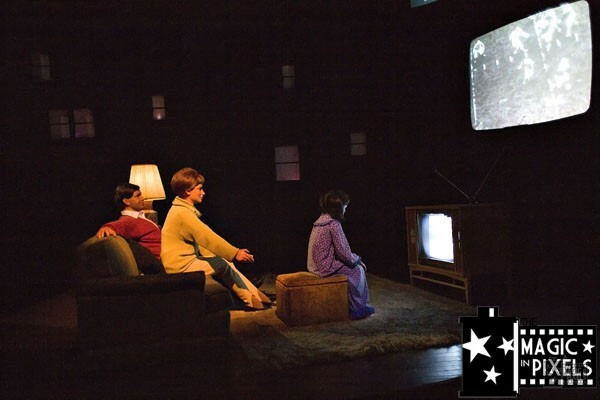 The date is July 20, 1969 and the family is watching the CBS News coverage of Walter Cronkite reporting on the Moon landing and the first moon walk, on live television. People all over the world were glued to their television sets as Neil Armstrong became the first man to walk on the moon. This includes those in Disneyland! 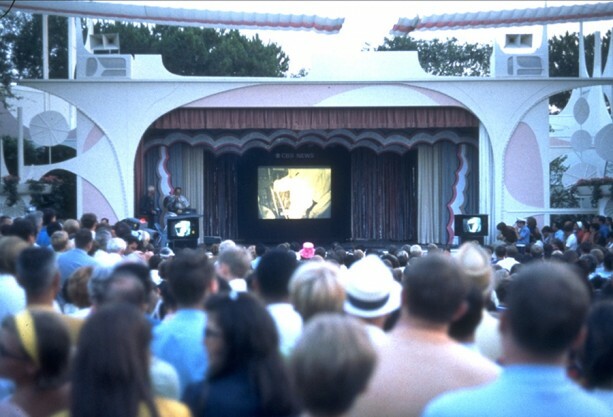 On the afternoon of July 20, 1969, just steps away from an attraction called “Flight to the Moon,” thousands of Disneyland park guests gathered at the Tomorrowland Stage to watch a seminal event in human history unfold on live television. The moon walk is an appropriate choice given Disney’s interest in space exploration. Disney’s Man and the Moon, first aired on December 28, 1955, fourteen years before man first walks on the Moon! This episode was the second in a three part series narrated by Paul Frees. Not only is this family joining 500 million others around the world in witnessing this event, its also the first world wide broadcast, and the televisual inauguration of a global satellite network (5). The first commercial satellite for communications launched in 1965 called the International Telecommunications Satellite Organization (INTELSAT). They were an international consortium till they went private in 2001. Today, Intelsat operates a fleet of over 50 communications satellites (6). We are truly communicating all over the world in an instant. Props to the imagineers for a subtle detail on this scene. 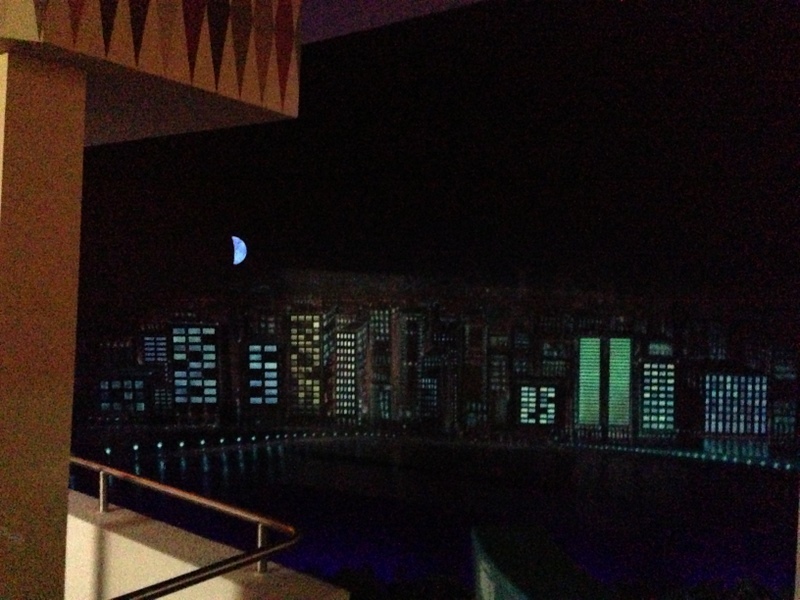 There is a window to the right of the TV to the balcony that shows a skyline with the Moon. The Moon’s phase is now accurate for the date 7/20/69: waxing crescent, 25% illuminated (7). By now, we’re all communicating from anywhere on Earth and in 1969 from somewhere else. Then television brings the world into our homes profoundly changing our perceptions of life itself. With Rocket Fire and Satellite we sent WALLS forth in all directions; North – South – East – West. With instant sound and sight we touched each nation of the world – each city – each home – each man, woman and child. We brought to every CAVE the knowledge of who we are – of what we are – of what in the world is going – NOW!